On Monday, 25th August 1958, at Eastbourne Station, at about 7.29 a.m., in the Southern Region, British Railway. The 7.45 p.m. car-sleeper express steam train from Glasgow ran past the home signal at Eastbourne at danger, and collided at a speed of about 25 m.p.h. with the 6.47 a.m. multiple-unit 12-coach electric passenger train from Ore to London Bridge, which was about to start from No. 4 platform under clear signals. This train reverses at Eastbourne which is a terminus station. The impact was heavy, and the steam engine ploughed into the leading coach of the electric train which was telescoped into the one behind it. Both vehicles were forced into the air and turned on to their sides on the platform as the train was pushed back over the short distance to the buffer stops. The leading coach struck and dislodged a heavy signal gantry above it as it rose in the air, but the gantry fortunately fell clear of the capsized coaches. The electric train was not heavily loaded and there were few passengers in the first 2 coaches; I regret to report, however, that 3 passengers and the motorman were killed, and a fourth passenger died in hospital from his injuries a few hours later. Twenty-two more passengers required treatment in hospital, though it was only necessary to detain five of them, and eighteen others were treated for minor injuries at the station. The damage to the passenger coaches of the steam train was slight and only one passenger received minor injuries. The emergency call for assistance was made without delay and there was a prompt response from the police and medical services, and from the St. John Ambulance Brigade and the Women's Voluntary Service. There was, however, a little delay in calling for the Fire Service which, as a consequence, did not arrive on the scene until nearly half-an-hour after the accident. I was advised by Mr. R. W. Walker, the Chief Constable of Eastbourne, that this was due to a misapprehension in the Police Station where the emergency arrangements were made. There was no question of fire but Mr. Walker considered that the trained efforts of the firemen with their lifting and cutting equipment would have expedited the freeing of the injured from the wreckage. The standing instructions have been amplified for guidance in the future. The Eastbourne Transport Department provided oxy-acetylene cutting gear and jacks from a depot near the station to help in freeing passengers, and the Corporation Information Service was put at the disposal of the Railway to collect information and deal with enquiries. The Corporation staff also organised refreshments for the passengers and for the rescue teams. The Post Office provided additional telephone facilities to the Railway and Lent a telephone operator to help in dealing with the many telephone messages. The circuit breakers on the power supply to the electrified line tripped automatically as a result of the accident, and power was cut off from the adjacent lines within a minute on receipt of prompt news of the collision by Electrical Control. The work of clearance and restoration necessitated the station being closed until 1.45 am. on the following day except for the evening car-sleeper train to Glasgow, and a special bus service was provided to carry passengers between Eastbourne and the temporary terminal points at Hampden Park and Polegate. The weather was stormy, with heavy rain squalls at times from the west. Eastbourne is a terminus station at the end of a short spur line from the South Coast route which runs through Brighton and Lewes and the junction at Polegate for Eastbourne, past Stone Cross which is the junction for Eastbourne for trains coming from the opposite direction, to Hastings and Ore, and on into Kent. The route from London to Eastbourne via Three Bridges joins this line at Lewes. As will he seen from the location plan the routes from East and West towards Eastbourne meet at Willingdon Junction just north of Hampden Park station. The distance from Polegate signal box to Eastbourne box is about 4 ¼ miles and from Hampden Park box, 1 ¾ miles. The alignment of the track for the last ¾ mile southwards into Eastbourne, which is the Down direction, is in a continuous right-handed curve as will be seen from the scale plan, and the gradient for the last 3 mile is slightly rising. The relevant Down line signals are the Eastbourne home signal, No. 3. 568 yards from the box, the Eastbourne distant signal, No. 2, 800 yards from the home signal, and on the same post as the Crumbles Intermediate home signal. No. 1; which is worked electrically from Eastbourne box, and the Crumbles Intermediate distant signal, worked with the Intermediate home signal and 800 yards from it. This last signal is 940 yards ahead of the Hampden Park Down starting signal. The Up line signals to which reference will be made, are Eastbourne No. 4 platform starting signal, No. 36, close to the box, and the advanced starting signal, No. 35, near the Down home signal. The Up Crumbles Intermediate home and distant signals are near the Down Crumbles Intermediate distant and home signals respectively. The Down line is track-circuited from Hampden Park starting signal to the buffer stops on all platform lines at Eastbourne, and track circuits extend on the Up line from Eastbourne to 200 yards past the Up Crumbles Intermediate home signal. The Down home signal, No. 3, is provided with a theatre type route indicator as it leads to any of the 4 platform lines, and it is fixed on a bracket arm cantilevered from the post to the left of the line as is shown by the sketch on the plan; there is a calling-on arm below it. The parapet of Whitley Road Bridge, immediately behind the signal post, is painted white to show up the calling-on arm, but the home signal can be seen above the bridge against a sky background from an approaching train. Because of the curvature it only comes into view from the driver's (left-hand) side of a B.R. Class 5 engine, the type involved in this accident, at about 128 yards range. From the fireman's side it can be seen 330 yards away, a longer view over the chord of the curve being prevented by trees outside the railway boundary. No. 4 platform, at which the 12-coach electric train was standing when it was struck by the incoming express from Glasgow, is 283 yards long and extends up to the signal box. It is bridged by a signal gantry at about 25 yards from the end, on which the starting signals for the other three platform lines are placed, but the starting signal for this platform line, No. 36, is a little further ahead, as the line does not extend as far as the others at the terminus end and the leading coach of a 12-coach train at the platform stands under the gantry. No. 36 signal leads to the Up Advanced starting signal, No. 35, by points Nos. 32 and 27 reversed and No. 18 points in the normal position which is for the crossover route, or by Nos. 15 and 10 reversed, which is the more usual route and the one set for the electric train on this occasion. Eastbourne signal box is of usual design with an elevated working floor 16 ft. 6 ins. above rail level, and it is equipped with a 72 lever mechanically interlocked frame with an illuminated diagram above it. Indicators are provided to show the position of all signal arms which cannot easily be seen from the box, including No. 3. The thorough mechanical interlocking between point and signal levers which necessitates the relevant point levers being correctly positioned and the conflicting signal levers normal in the frame before any signal lever can be pulled, is supplemented by electrical locking and detection which ensures that the points are properly set, the arm of the signal ahead is at danger, and the route is clear, before the signal lever is made free. So far as No. 3 Down home signal is concerned, the arm of the signal must be at danger and the lever normal in the frame before No. 1 lever can be pulled, and the route into No. 4 platform must be properly set, which includes No. 10 points normal, and the track circuits in the line to the buffer stops indicating clear, before the route lever (No. 4) and No. 3 signal lever can be pulled. As already mentioned the usual route for an outgoing train from No. 4 platform which was set on this occasion requires, amongst others, No. 10 lever to be operated before No. 36 signal lever is pulled. Block signalling between Hampden Park and Eastbourne is affected by 3-position instruments, and there are comprehensive block controls so that the Down starting signal lever at Hampden Park is released electrically by turning the commutator on the Down line instrument at Eastbourne to Line Clear. Before this commutator can be operated No. 1 lever and the arms of the Crumbles intermediate home and distant signals, and the arm of the Eastbourne distant signal, must be normal; in addition the track circuits up to, and 250 yards beyond, the Crumbles home signal must be clear. A Down train can be brought up to the home signal (No. 3) when the route is set for an outgoing train from No. 4 platform via No. 10 points, as the overrun of 268 yards beyond this signal is considered adequate in view of the moderate speeds of trains approaching this terminus station. The "Out of section" bell code is sent when a Down train has cleared the track circuit which overlaps the Crumble intermediate home signal. (c) The arm of No. 3 signal has to be at danger and the lever normal in the frame to release the electrical lock on No. 1 signal lever. The electric train consisted of two 6-coach units with connecting gangways in each unit. The leading coach was a "motor second brake" weighing 59 tons with the brake compartment immediately behind the motorman's compartment, and open type second-class accommodation; the second and third coaches were of corridor type weighing 35 and 36 tons respectively, and the fourth coach was a Pullman car weighing 43 tons. The last two coaches of the set were another corridor coach and a replica of the leading coach, with the motorman's compartment at the trailing end. The rear 6-coach unit was of similar composition to the leading one, except that it had a buffet instead of a Pullman car. Screw couplings were in use between all coaches. The weight of the train was 511 tons and the length over buffers 264 yards. The steam train was drawn by a B.R. standard class 5 engine with 4 - 4 4 wheel arrangement, and a 6-wheeled tender; it was fitted with the steam brake and combination valve which applies the brake when the train vacuum brake lever is operated, and it weighed 125 tons fully loaded. The driver's position was on the left hand side and the engine was equipped with a speedometer which is conveniently placed at eye level on the driver's side of the firebox. Glass windscreens were fitted outside the side windows of the cab. Behind the engine was a "brake second" coach which was fitted with side lookouts for the guard followed by an " open second." and three sleeping cars. Thereafter there were ten vans, some 4-wheeled, for motor cars and luggage; and a guard's van in rear. The passenger coaches were fitted with the direct admission valve which quickens the rate of application of the vacuum brake. The tare weight of the coaches and vans was 344 tons and the brake power available on the train was 75%, of the total weight including the engine of 469 tons. The length over buffers was 277 yards. The 6.47 a.m. electric train from Ore to London Bridge arrived four minutes late in No. 4 platform at Eastbourne at 7.25 a.m.; it was about to leave for London under clear signals when :he collision occurred at 7.29 a.m., four minutes after the booked departure time. The 7.45 pm. express train from Glasgow was running about six minutes ahead of the booked time as it approached Eastbourne station on the Down line. After passing signal No. 2 at caution and No. 3 at danger it burst through the trailing end of No. 10 points and then travelled over No. 15 crossover which was set for the outgoing route from No. 4 platform, past the signal box, and as already mentioned collided at a speed of about 25 m.p.h. with the electric train. The impact was such that the steam engine smashed the front of the leading motored coach and pushed the body off the bogies into the air against the signal gantry, which was dislodged and brought down. The rear end of the coach was at the same time forced into the one behind which it penetrated for about one-third of its length. The forward movement of the engine under the two, interlocked, coach bodies continued for 137 ft. beyond the point of collision, with the bodies rising in the air until they fell on their sides on to the platform. 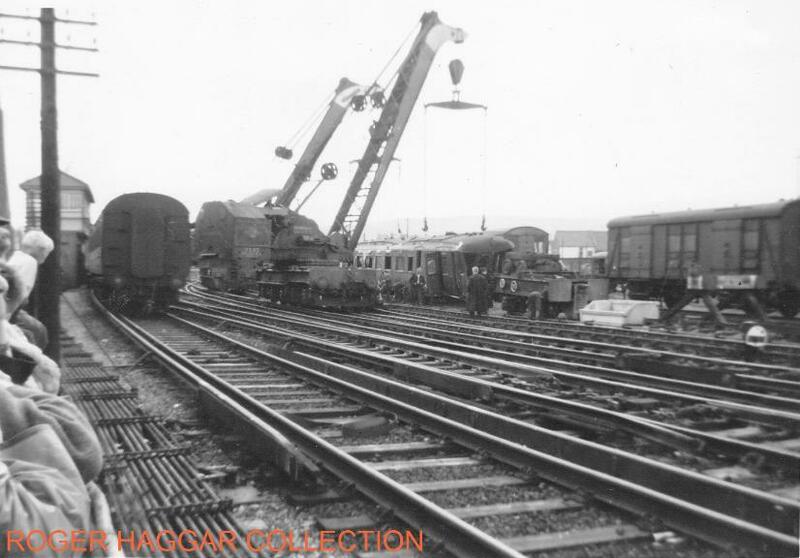 The two bogies of the first coach and the leading bogie of the second coach were carried forward in a jumbled mass by the engine. The electric train, which did not have the brakes applied, was pushed back about 16 feet over the sand drag and against the buffer stops, the full compression of all buffers allowing another 10 feet of movement at the London end of the train. Motorman C. Brock did not leave the driving compartment; he must have seen the steam train bearing down upon him only at the last moment, and he must have been killed instantly when the collision occurred. 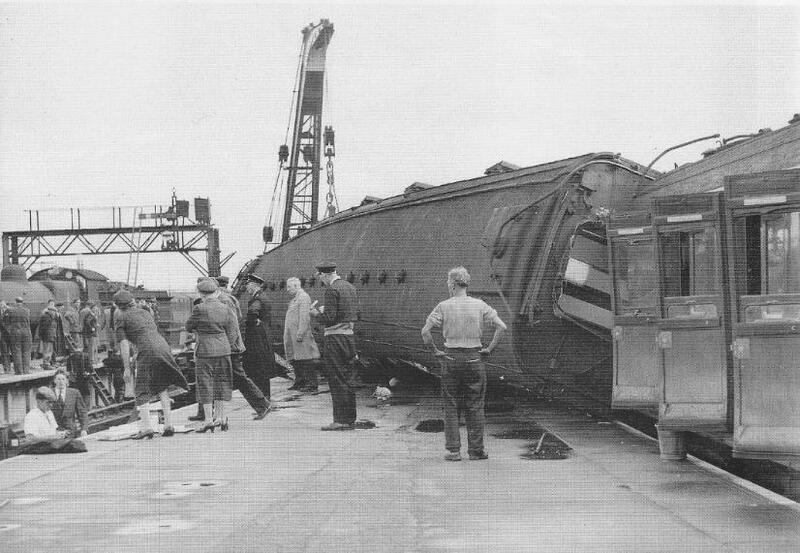 The main force of the collision seems to have been absorbed by the two leading coaches as the body of the third coach was not seriously damaged though the underframe was bent; most of the other coaches suffered some damage to underframes, head stocks and buffers, but little to the bodywork. The weight and constructional strength of the steam engine kept it close to the track alignment, though it became derailed. The front end and the smoke box were much damaged, and the bogie centre and support beam were fractured, and the motion and the right side of the main frame bent, but the boiler was more or less intact as was the cab. The leading wheels of the first coach were derailed and the coach was buffer-locked with the engine; interior damage to this coach was however comparatively slight, and the effect of the collision on the other passenger coaches also was small. There was much heavier damage at the rear end of the seventh vehicle, a bogie van, and the body of the eighth one, a 6-wheeler was riven and displaced from the frame. 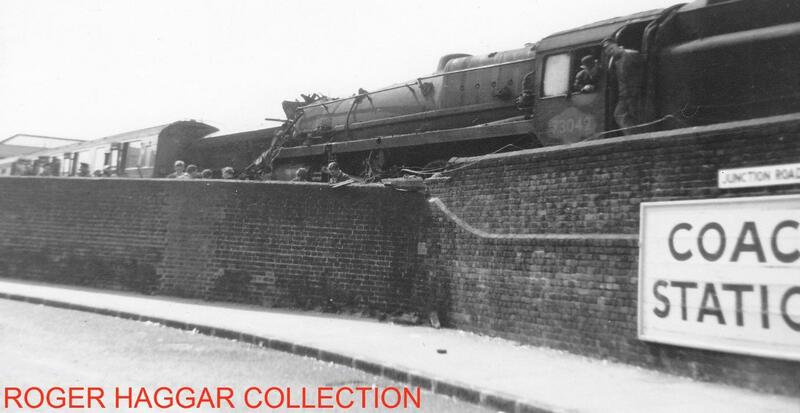 Appreciable damage was also suffered by the eleventh and twelfth 4-wheeled vans which were partially derailed, and had wrenched bodywork and bent buffers. The ninth, tenth and thirteenth vans were affected to a lesser degree, but the last 3 vehicles were intact. As already stated there were comparatively few passengers in the first 2 coaches of the electric train; evidence suggests not more than a dozen in each coach, otherwise the shock of the collision and the telescoping between the first two coaches must have caused many more casualties. The first of a number of ambulances arrived at the site at 7.33 a.m. and doctors arrived a few minutes later. The casualties were taken to St. Mary's Hospital and the Princess Alice Hospital, Eastbourne, where all preparations had been made for their care. Brief mention of help rendered by other Services has been made earlier. Before taking the evidence of railwaymen concerned with the collision. 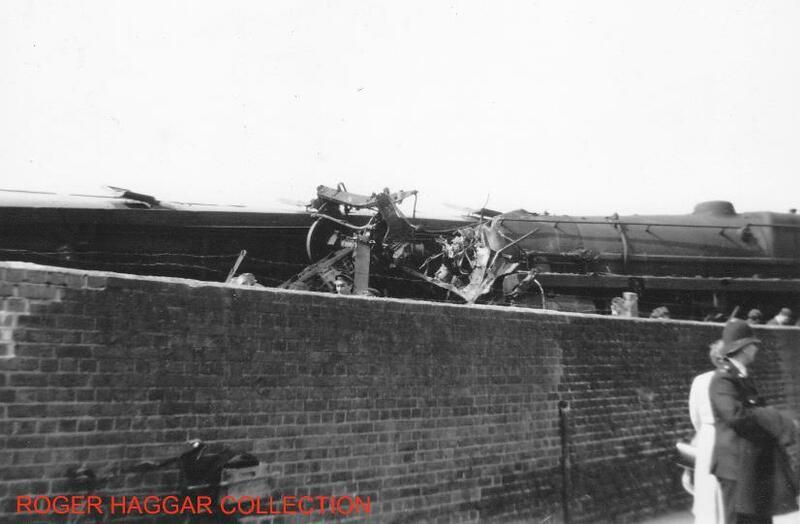 I asked Mr. F. J. Pepper, 1 the Carriage and Wagon Engineer, and Mr. J. Rodgers, the then District Motive Power Superintendent, brighton, who were present with me at the Inquiry, for their opinions about the speed of the collision based on the damage. Mr. Pepper thought that the speed would have been between 25 and 30 m.p.h. while Mr. Rodgers' estimate was between 20 and 25 m.p.h. These opinions matched my own and I assessed the speed of the collision to have been in the region of 25 m.p.h. Station Foreman C. R. Turk said that he was standing by the guard's compartment of the electric train near the buffer stops when he heard the express train approaching the station. He had seen the starting signal repeater which is half-way along No. 4 platform, in the clear position, and he knew that the points to the Up line must therefore be set for the outgoing route from this platform; he realised that a collision was imminent and he started to run towards his office without waiting for it to take place. The Police answered his telephone call at once and he left the emergency rescue calls to them in accordance with the arrangements here after stating the gravity of the accident; lie then continued with the necessary railway reporting and arrangements for special bus services. Guard S. W. George said that he had just entered the rear brake compartment of the electric train and was about to test the brakes, which were off, when the collision took place. He considered that the surge backwards of the train into the buffer stops was quite violent; it was enough to jam the door of his compartment. He said that during the run into Eastbourne from Ore the clouds had been heavy but visibility had been good. Porter T. Westgate had removed the tail lamp from the London end of the electric train; he passed the motorman as he began to walk back along the platform and exchanged a remark with him about the weather, which had eased somewhat from the stormy conditions of a little earlier. He was opposite the middle of the leading coach when he heard the express approaching; he looked round and saw that it was running hard into No. 4 platform and, as he said, ran for his life. Motorman G. J. Fitzgerald who had joined the electric train as a passenger at Hampden Park, was standing by the sixth coach when he saw the express train come under Cavendish Place Bridge and realised a moment later that it was running into No. 4 platform. He had an end-on view of the train and could not therefore judge whether it was running exceptionally fast or not. He said that it had been raining moderately at Hampden Park and was still raining when the collision took place. Both men applied themselves at once to rescuing the injured. Lengthman J. K. Falconer, who was standing outside the permanent way hut about 80 yards from the signal box towards Cavendish Place Bridge on the far side of the tracks, said that he saw the express train emerge from under the bridge and thought at once that it was travelling faster than is normal for trains on this part of the run in to Eastbourne. He did not hear a whistle before the crash. Carriage and Wagon Examiner, W. C. Jefferies, who was at his office not far from Falconer's position, also saw the express train approach, and was sure that it was running faster than normal. After the collision he examined the position of the brake pistons on the express train and noted that they were all in the "brake applied" position. Later, when the coaches were being removed, he released the vacuum in the upper part of the cylinder on some of them; he judged that the vacuum had been good. He did not hear the sound of brake blocks bearing on the wheels as the train ran in and he was sure that he would have heard it if the brakes had been fully applied. He described the weather conditions as a light drizzle at the time of the accident though the rain had been heavy previously. Signalman R. G. Vine was on duty in Eastbourne box. He is 59 years of age and is a special class "A" signalman. He has been at Eastbourne for the past four years and, at the time of the accident, was near the end of a 10-hour turn of duty. The extra two hours on this shift on Monday mornings is an approved arrangement for weekend relief, and he said that he was not unduly tired. Vine accepted the electric train from Hampden Park in the normal way and set the route and gave the signals for it to proceed to 4 platform. After it had cleared the track circuits connected with the Crumbles Intermediate home signal he restored Nos. 1 and 2 levers in the frame and gave Train out of Section; he then restored No. 3 lever as soon as he saw from the track circuit indicator that the train had passed that signal. He was offered the Glasgow train and accepted it at once and pulled No. 1 lever again for the Crumbles Intermediate signals as the line was clear to the over-run point beyond the home signal, No. 3. (Rule 39(a) of the Rule Book does not apply here.) In the meantime the electric train had arrived at No. 4 platform and Vine set the outgoing route for it to leave towards London and obtained Line Clear for it. He pulled the starting signal lever No. 36 and the advance starting signal lever No.35. He was quite sure that he had seen the indicator in the box show that No.3 signal arm had returned to danger when he restored the lever to the frame, and he said, quite correctly, that he could not have pulled No. 1 lever for the Glasgow train if No. 3 signal arm had remained off as the electrical locking would not have allowed it. Vine watched the track circuit indicators on his diagram as the Glasgow train approached, and gave "Out of Section " when it cleared the appropriate track circuits; he then saw the track circuit ahead of the Eastbourne home signal show " Occupied." He ran along the frame and restored No. 36 signal to danger and then went to the window with a red flag to try to attract the attention of the driver of the incoming train which was then coming through Cavendish Place Bridge. He also gesticulated to the motorman of the electric train and saw him crouch down. He did not see the steam train driver nor did he hear the engine whistle or any sound of a brake application before the collision. He confirmed that this sound could generally be heard from the box. Vine was sure that the train came in very fast and that the engine lurched as it travelled over No. 15 points. He said that it was not raining hard at the time though the rain had been heavy earlier on; the visibility was good. After the collision Vine took proper action to protect the lines which included placing the Down line block instrument at Train on Line, and arranged to have the traction power cut off. He replaced the Up advanced starting signal lever and the Up Crumbles Intermediate signal lever in the frame, but left the others untouched. Signalman J. Funnell, who was in Hampden Park box, confirmed Vine's evidence about the block working. He said that the Glasgow train was offered to Vine and accepted by him in the normal way; it passed his box under clear signals travelling at normal speed and he received Train out of Section for it shortly afterwards; he was waiting for Train Entering Section for the Up electric train when he was given the Obstruction Danger bell code. He then protected the Down line with detonators. Funnell thought that when the Glasgow train passed visibility was good and the rain was less heavy than it had been. Signalman E. A. Doswell, who was on duty in Polegate box that morning, said that the Glasgow train stopped at the station for about 2 minutes; it passed his box at 7.23 a.m. and he received "Out of Section" for it from Hampden Park at 7.26 a.m. The train is timed to leave Polegate at 7.26 a.m. after a halt there of 11 minutes, for operating reasons, but there is no objection to it departing earlier if the signalman is given Line Clear for it. 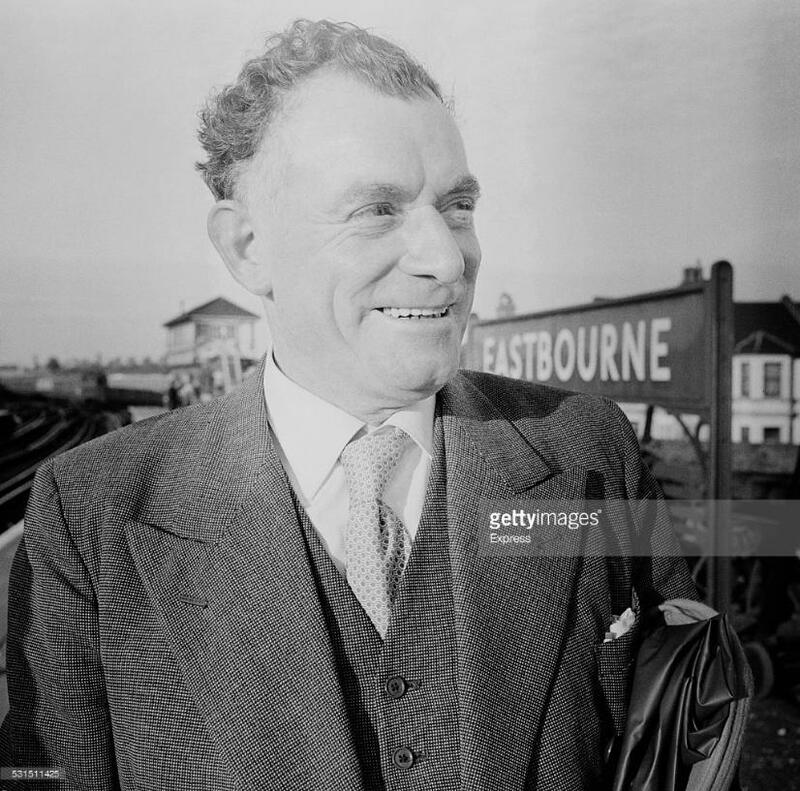 Mr. M. J. Robinson, Area Inspector, Polegate, said that he arrived at Eastbourne signal box at 8.25 a.m. and checked the signal apparatus and the levers. He found all in order, with the appropriate point and facing point lock levers reversed and Nos. 3, 8 (the " calling-on " arm under No. 3), and No. 17 (a shunt signal on the same post), levers normal in the frame. The repeaters were showing "On" and the block indicator for the Down line was at "Train on Line." He then inspected Nos. 3. 8 and 17 signals and saw that they were at danger. Driver A. Wembridge was in charge of the 7.45 p.m. car-sleeper express steam train from Glasgow. He was nearly 63 years of age at the date of the accident, and he has been in railway service since 1919 when he was approved as a fireman after a few months' service as a cleaner. He was passed for driving duties in 1945 and was appointed driver in the following year. His headquarters had always been on the former Central Section, first at Brighton Depot and later at Battersea Park and Stewarts Lane Depots. 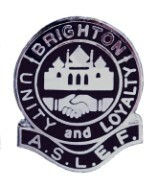 He said that he was qualified to drive on most of the routes of the Central and Eastern parts of the Southern Region and that although he had not travelled over the Lewes to Eastbourne portion of the route from London since April, four months before the date of the accident, he was thoroughly familiar with it and knew the signals. From further enquiries I found that he had made a refresher trip between Lewes and Eastbourne two days before the previous occasion in April when he drove a train over it, as he had not been over the route for the previous 16 months. Refresher trips are a well-established procedure on the railway and drivers are expected to make them when the need arises. He had last certified his knowledge of the route on 2nd May 1958. Wembridge booked on duty at 3.40 a.m. at Stewarts Lane after a proper amount of rest, and drove the engine to Mitre Bridge Junction where his fireman coupled it to the Glasgow train after the other engine had been detached. He said that he had no difficulty in creating vacuum to 21 ins. on the gauge hut did not make a brake test as the driver of the other engine had told him that the brake was satisfactory; he noted from the gauge, however, that the guard had made a test. During the trip the brake worked satisfactorily and the engine ran well. The train was 12 minutes late on leaving Mitre Bridge Junction at 5.43 a.m. and there were some checks on the way, hut the timing is easy and the train reached Polegate Junction only 6 minutes late at 7.21 am. The signals were given for it to proceed towards Eastbourne 2 minutes later and Wembridge appreciated that he was then ahead of time. The stormy weather had not affected the running but he said that the front glass in his cab had been obscured by dirt and smoke and that he had to put his head out of the side window, which was fitted with a windscreen, to see the signals. "Then, when I straightened out, the obstruction was in view. I applied all my brakes hut there was not sufficient margin to act." He did not see the signalman in the box waving a red flag." Wembridge stated that be $as travelling at not more than 10 m.p.h. when the collision occurred, though he agreed that the damage caused was not consistent with this estimate of speed. He also admitted that his engine was rolling as it went through the crossover, which extends from about 200 yards to 120 yards from the signal box, where he assessed his speed to have been about 15 m.p.h., which is the permitted limit. Wembridge did not mention seeing the home signal until he was questioned about it. When asked whether he had definitely seen it, he said that he thought that he had seen it in the off position. He was not clear in his evidence but his explanation appeared to be that he was straining his eyes in the heavy rain and had visibility to see the home signal which only comes into view from the left hand side at short range, and that he must have blinked and have imagined that the signal was off. He said that after the accident happened he realised that he must have made a mistake. It was clear that the speed of the train was much too high as it ran into Eastbourne. I therefore asked Driver Wembridge a number of questions about his health and eyesight and state of mind on the journey, and what were his working arrangements with his fireman about looking for signals, in order to find out any possible cause for his failure to control his train as it approached and ran past the home signal; I was not_ however, successful. He said that his eyesight was perfect and that he only wore glasses for reading; his home life was tranquil and he had no worries to distract his mind; he did not suffer from absent-mindedness or lack of concentration, and though he was due for annual leave in October he was in no way preoccupied about it. He had had a full day's rest on the previous day which he had spent at home, and was fresh when he took up duty. He had not worked recently with the fireman hut knew him to be a good worker, and he did not give him any instructions about looking out for signals; not even in the difficult weather conditions on this occasion did he tell him to look for the Eastbourne home signal which comes into view so much sooner from the fireman's side of the engine. Wembridge could not account for the excessive speed at which his train must have been travelling as it ran into this terminus station, a speed much higher than is proper even when the signals are at clear; nor would he admit that it had been high. He said that he did not take his eyes off the road to look at the speedometer as the train ran into Eastbourne and that it was not his practice to do so when approaching signals. Fireman J. C. Gilbert of the Glasgow train had not worked with Driver Wembridge for about a year since he had accompanied him on a trip with a parcels train from London to Fratton. Gilbert is 29 years of age and has been a fireman for the past 5 years, after working 2 years as a cleaner. He said that he attended improvement classes and that he hoped to be passed for driving in about another 2 years; he knew a number of the routes on the eastern section of the Region but did not know the route beyond Three Bridges to Eastbourne although he had been there before; he had not therefore been looking out for signals beyond Three Bridges on this trip. When I asked him how he expected to increase his knowledge of routes if he did not look out for signals on new routes he said that drivers pointed out signals to firemen but that there was no time to learn signals on a journey such as this with a heavy train travelling at speed. He added that Driver Wembridge had not pointed out signals to him and had not at any time asked him to look for signals, and Gilbert did not volunteer to look out for the signals on approaching Eastbourne, though he knew that the line was on a right handed curve. He inferred that it would have been presumptuous to make such a suggestion, even in the inclement weather and with the better view ahead from the fireman's (right hand) side when approaching this terminus. Gilbert confirmed his driver's statement that the engine had been in good running order and he said that he had had no trouble in maintaining steam during the run with the long train. He saw the signals at clear as the train left Polegate but, thereafter, he did not take notice of the route. He said that he had tidied up the footplate and that he was adjusting a water injector as the train approached Eastbourne. He did not recollect the engine passing under either of the overline bridges, nor a lurch as it took the crossover, though he remembered that there had been a partial brake application during the approach into Eastbourne. I pointed out to him that if he had looked ahead as they ran into the station, as he should have done, he could have seen the train in the platform from about 200 to 300 yard: away, but he insisted that he could not have seen more than a short distance ahead because of the rain, and that he had been fully occupied with his work in the cab and had not looked out until immediately before the collision; he noticed that the driver made a full application of the brake, and he crouched down behind the seat on his side of the engine just before the impact. He had had little talk with the driver on the journey and they had not spoken after leaving Polegate; after the accident the driver did not speak to him. I told Fireman Gilbert that I could not believe that he had taken so little interest in the route during the run into Eastbourne, and that it was unnatural for a fireman of his experience not to have noticed more than he said he had, but he would give no more information about what had taken place on the engine before the collision. Goods Guard C. E. Willoughby, who had joined the Glasgow train with the engine crew at Mitre Bridge Junction, is 38 years of age and has 10 years railway service as a guard. He said that he had not been in charge on this train before but knew that it was customary for the guard to travel at the front of the train, close to the passengers in the sleeping cars, as there is no attendant; he therefore travelled in the leading coach. He did not test the brake from the rear of the train but accepted the word of the guard whom he relieved that it was satisfactory; he did, however, make a brake test from his compartment in the leading coach after the engine had been changed and his gauge was showing 21 inches of vacuum, and he was fully satisfied with it. Willoughby was thoroughly familiar with the route and he observed many of the signals, though he said he had to put his head out of the window to do so as the side look-out glasses were very dirty after the long journey. He had to move from one side of the compartment to the other a number of times when viewing signals because of the curvature of the line. He said that he had seen the signals at Polegate and at Hampden Park, and he confirmed that the Eastbourne distant signal beneath the Crumbles intermediate home was at caution. He emphasised, however, that he failed to see the Eastbourne home signal because of the rain which had become torrential so that he would have been blinded by it if he had put his head out of the window. He considered this signal to be an easy one to see in normal circumstances. Willoughby said that he thought the speed had been reduced to about 15 to 20 m.p.h. as the train ran under Whitley Road bridge hut considered that it was travelling too fast so he looked at his vacuum gauge indicator which he saw at 15 inches; he noted that the vacuum was dropping further and then, as he said, settled down on the off side to wait for the train to run into the terminus normally. He expected the train to run into No. 3 platform but suddenly realised that it was taking the crossover road to No. 4 platform which he saw was occupied. The rain had now become less heavy, enabling him to see ahead. WhenI asked him why he did not immediately apply the brake when he became aware that the train was taking the crossover road he said that the vacuum was destroyed and the brake fully on. After the accident a thorough examination was made of the signalling equipment at Eastbourne and of the block signalling controls between that box and Hampden Park. Except for damage caused by the accident everything was found to be in perfect working order and all the tests gave correct results. Tests were also made of the brakes on the Glasgow train, though there was no suggestion that these had failed in any way, and they were found to be in order. Because of the curvature on the approach to Eastbourne I checked the siting of No. 3 home signal. The distance at which the signal can be seen from an approaching train has already been recorded; I found the visibility of the signal, with its sky background, to be good, and there are no objects near the line of sight to distract attention. The bridge immediately behind the signal provides an obvious landmark for it and there is little vehicular traffic over the bridge which might interfere with the clear background. In order to compare the running of the Glasgow train into Eastbourne with a normal approach, I asked for a number of observed runs with a similar train to be made. In general the speed passing Hampden Park when all signals are clear is of the order of 45 m.p.h. ; the driver closes the regulator at the Crumbles Intermediate distant signal, and makes a partial brake application, reducing vacuum by about 10 inches, at the Eastbourne distant signal. This has the effect of reducing speed to about 20 m.p.h. at Eastbourne home signal, and to 15 m.p.h. when travelling over No. 15 crossover. The brake then has to be released to enable the train to run into the platform before it is applied again to stop it finally. On one run when a higher approach speed of 50 m.p.h. was obtained the rather more vigorous brake application at Eastbourne distant signal so checked the train that after the brake had been released the regulator had to be opened again to enable the train to reach the platform, These observed results show the ample braking distance available to trains approaching Eastbourne and the amount to which speed is reduced on a normal approach, about 15 m.p.h. at the crossover and not more than 10 m.p.h. when passing the signal box. Note: The propagation time of the brake throughout the train is about 4 seconds. I find it difficult to accept the evidence of the train crew about the exceptionally heavy rain as the train approached Eastbourne; though localised heavy rain is not unknown, the evidence of others, both at Hampden Park and at Eastbourne showed clearly that the rain had eased at the time. I have no doubt, in view of the evidence of a number of eye witnesses and of the damage caused to the electric train, that the speed of the Glasgow train at the moment of impact was considerable. I am satisfied that it was over 20 m.p.h., and probably about 25 m.p.h. I consider that the train crew were not truthful in their evidence on this matter. The speed of the train during the approach to Eastbourne can readily be deduced from the speed of impact and from the method of working. Driver Wembridge said that he closed the regulator when he passed the distant signal which he saw to be at caution; thereafter, the train must have run under its own momentum, gradually losing speed- and retarded further perhaps by a slight brake application near the home signal, until the final full application just before the collision. The speed over crossover No. 15 must therefore have been in the region of 30 m.p.h. which is confirmed by the evidence of lurching as the engine travelled over it, and at the home signal, 360 yards before the crossover, 35 m.p.h. or even higher. Nevertheless, although the speed was excessive it will be seen from the table of stopping distances that it was not so high that the train could not have been brought to a stand before reaching the buffer stops if it had been running into an unoccupied platform. There is no firm evidence that the Eastbourne home signal No. 3 was off when the Glasgow train passed it, while there-is abundant circumstantial evidence that it was properly at danger, and I am sure that this was so. Driver Wembridge had seen the distant signal at caution and he said that he was looking out keenly for the home signal but had to blink his eyes from time to time because of the heavy rain. At the speed at which the train was travelling the signal would only have been in view on the driver's side for 6 to 8 seconds, and if Wembridge did close his eyes on this occasion it may have been for longer than he thought; he may then have assumed when he opened them again, perhaps as the engine passed under the road bridge immediately beyond the signal, that the signal must have been off. The approach view of the home signal was short, but here, where it is the last signal before a terminus station where approach speeds should always be moderate in preparation for the invariable stop, the shortness of view is not a potential source of danger if the driver is alert. Wembridge himself did not state that he could not see the signal; his excuse was that the heavy rain caused him to misread it. Apart from his mistake over the signal I am of the opinion that Wembridge cannot have been fully alert as the train approached Eastbourne, or he would not have allowed it to travel so fast. The speed was excessive and he should have made a much stronger brake application to reduce it as he approached the signal, even if he was convinced that it was off. I consider therefore that Driver Wembridge must accept full responsibility for the accident. I am at a loss, however, to account for his failure to control the train as it approached Eastbourne, and for his assumption that the signal was off. I have no reason to disbelieve that he had put his head out of the side window and that he had been staring ahead to see signals, and it may be that his effort of concentration in poor weather conditions during the journey from London merged into a state of passivity as the train ran past the home signal and over the crossover, until he was galvanized into action when the electric train ahead suddenly came into view. Alternatively, his knowledge of the route may not have been as good as he said it was, though it is difficult to understand how he could possibly have become lost on the run into Eastbourne with such distinctive landmarks as the two overbridges. Driver Wembridge willingly agreed to undergo a strict medical examination after the accident; he was considered fit for his age, with a normal reaction time, and not absent-minded. I was given no assistance by Fireman Gilbert in finding out what happened on the footplate during the vital time. As I have said, it was unnatural for a fireman of his experience, who was hoping for promotion in the not far distant future, to have taken so little interest in the control of the train as it ran into Eastbourne, as he said he did; if true, his statements reflect no credit on his ability; if, on the other hand, he was withholding information out of mistaken loyalty to his driver, I can but say that his lack of frankness has not, helped towards reaching an understanding of Driver Wembridge's serious mistake. Such understanding might have helped Wembridge, and it would certainly have helped a more general study of the causes of drivers running past signals at danger. Goods Guard Willoughby's evidence seems to have been framed so as to excuse himself for having failed to look out for the home signal and to take action to control the train as it ran at excessive speed towards the station. l do not accept his excuse that the heavy rain prevented him seeing the home signal. Since the wind was from the West, and the signal was on the east side as the train ran southwards into Eastbourne, he could have put his head out on the sheltered side of the train to look for this signal, and would not then have been exposed to the full force of such rain as there was. His evidence about the loss of vacuum as the train approached Eastbourne is not in accordance with the other evidence and I do not believe it. This guard failed in his duty to look out for the home signal, and he failed thereafter to apply the guard's brake as the train ran at excessive speed towards the terminus. For this latter failure I do not blame him too greatly, since guards are in a difficult position over carrying out this duty in which keen judgment is involved. It was suggested that detonators might have prevented the accident or at least have reduced its severity. Detonator machines, if provided, would have been close to the signal box and would not have made any difference to this accident. It is, however, the policy to provide detonator machines as a part of all future modernisation schemes. Accidents due to drivers passing signals at danger have attracted much attention in recent years owing to the severe consequences which have been caused and, as mentioned in the concluding paragraphs of Brigadier C. A. Langley's Annual Report on the Accidents which occurred on British Railways in 1957, the British Transport Commission have recently arranged to make a special investigation into this matter with the help of a panel of scientific experts; the Trade Unions have promised their full co-operation. On Wednesday, December 10th last, Bro. Alfred Wembridge of our Battersea Branch stepped from the dock at Lewes Assizes following a three-day trial in which he was found Not Guilty of manslaughter and discharged. 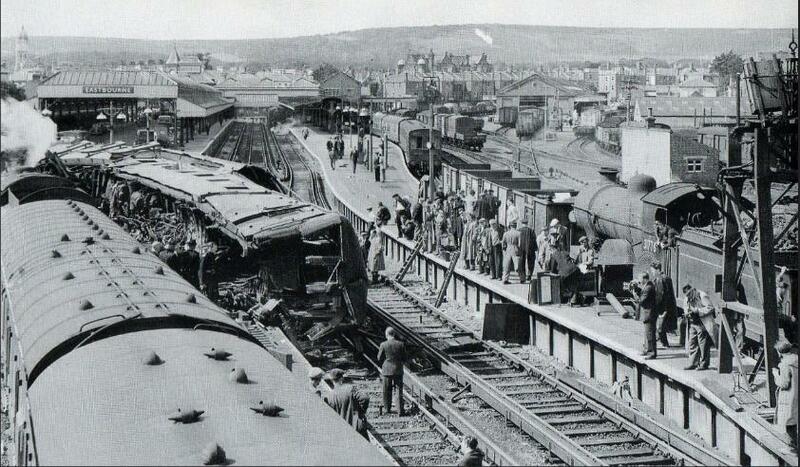 The charge had arisen from the collision on August 25th, 1958, when the steam train in which Bro. Wembridge was the driver ran into an electric train standing at Eastbourne station, Southern Region. Five persons had died as a tragic outcome of this accident. Locomen elsewhere will be glad to know that the A.S.L.E. and F. stood firmly behind Bro. Wembridge in his ordeal, and that the finest possible legal representation at all stages was engaged by the Society on his behalf. With the trial now behind him, we tender our best wishes for the future, trusting he will bear in mind the kind and encouraging words uttered by the learned Judge in pronouncing his discharge. There is one fact which the proceedings against Bro. Wembridge have emphassised in unmistakable fashion: namely, that a single mistake by a Driver in the course of his daily work can have the effect – if he himself escapes with his life – of bringing him to the dock on a grave criminal charge.